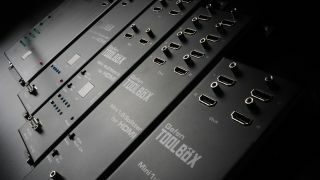 Gefen brings its ToolBox line of products to InfoComm this year. Offering a new form factor with enhanced features for HDMI v1.3, five new products come with built-in wall mountable capability in either a flat black or glossy white finish. The new Gefen ToolBox line is designed to supply an alternative to rack mounted systems, with a smaller enclosure, built-in EDID detection and support for both two-channel and multi-channel audio. All support high definition resolutions to 1080p full HD. Expanded HDMI v1.3 features include deep color, lip sync, Dolby TrueHD and DTS Master Audio. Two switchers, one matrix and two splitters are currently available under the ToolBox line. All five are compact solutions with all inputs/outputs for HDMI v1.3 on the front panel, easily accessible when wall mounted. Six-foot HDMI connection cables are included with locking HDMI capability to prevent disconnects when in the field.